Magdalena Mountain (Paperback) | Eagle Harbor Book Co. 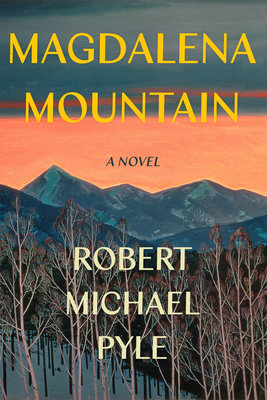 In Magdalena Mountain, Robert Michael Pyle's first and long-awaited novel, the award-winning naturalist proves he is as at home in an imagined landscape as he is in the natural one. At the center of this story of majesty and high mountain magic are three Magdalenas--Mary, a woman whose uncertain journey opens the book; Magdalena Mountain, shrouded in mystery and menace; and the all-black Magdalena alpine butterfly, the most elusive of several rare and beautiful species found on the mountain. And high in the Colorado Rocky Mountain wilderness, sharing the remote territory of the Erebia magdalena butterfly, lives the enigmatic Oberon, a reluctant de facto leader of the Grove, a diverse community of monks who share a devotion to nature. Converging in the same wilderness are October Carson, a beachcomber-wanderer in pursuit of the alpine butterflies he collects for museums; James Mead, a young graduate student intent upon learning the ecology of this seductive creature; and Mary Glanville, who also seeks the butterfly but can't remember why. While the mystery surrounding Mary takes a menacing turn, their shared quest pulls them deeper into the high mountain wilderness, culminating in a harrowing encounter on the stony slopes of Magdalena Mountain. ROBERT MICHAEL PYLE grew up and learned his butterflies in Colorado, where he fell in love with the Magdalena Alpine and its high-country habitat. He took his PhD in butterfly ecology at Yale University, worked as a conservation biologist in Papua New Guinea, Oregon, and Cambridge, and has written full-time for many years. His twenty-two books include Wintergreen (John Burroughs Medal), Where Bigfoot Walks (Guggenheim Fellowship), and Sky Time in Gray's River (National Outdoor Book Award). He lives in rural Southwest Washington State, and still studies butterflies.